Mr. B is at that age where he loves superheroes. Ok, I admit it...*I* am at that age where I love superheroes, too! 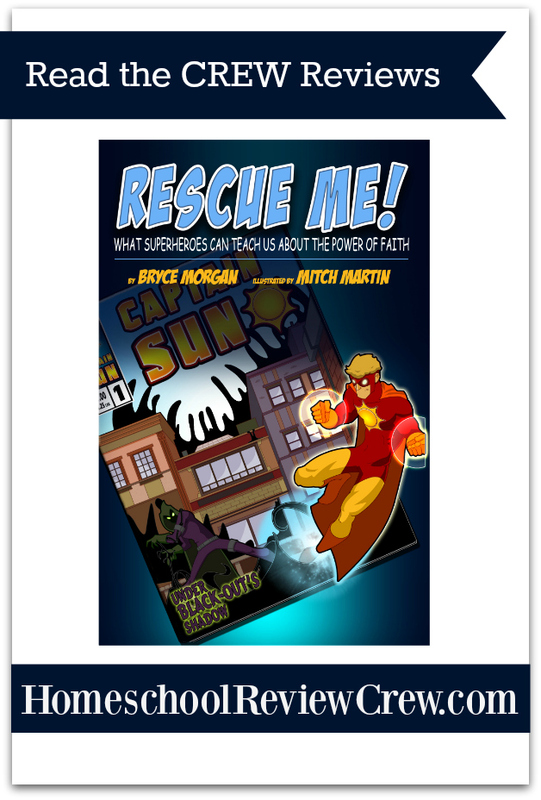 Having loved comic books since I was a little kid, I was as excited at Mr. B when Book 1, Rescue me! What Superheroes Can Teach Us About the Power of Faith arrived in our mailbox. this book is only one of three from The Captain Sun Adventures. Title: Rescue Me! 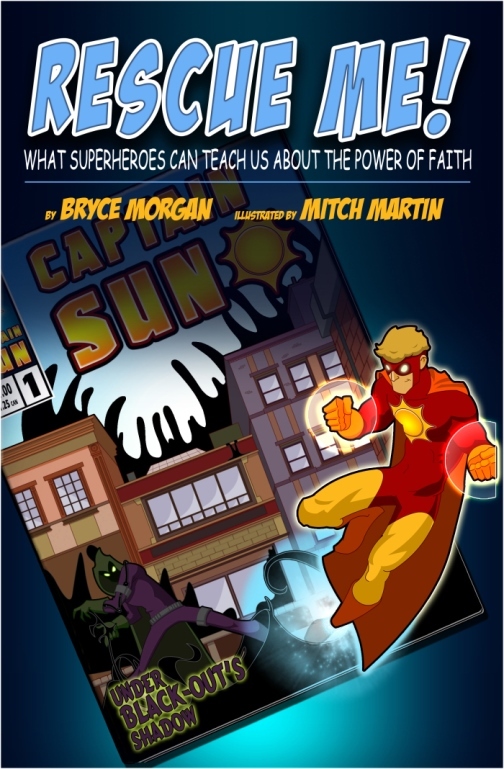 What Superheroes Can Teach Us About the Power of Faith Author: Bryce Morgan (Super big thanks for autographing this! My son flipped out!) Illustrated by: Mitch Martin Chapter count: 8 Page count: 39 ISBN: 9781466401471 Published by: M5 Productions We received: One paperback (glossy cover) but this is also available as an eBook via Kindle/PDF. This book is book one of a children's devotional that is part comic book, part kid's devotional, and 100% awesome coolness. It's set up like a comic book, so if your kids are into comics they will probably really like this. We are a comic family here, so this is right up Mr. B's alley. The other two books are: Book 2 Captain Sun and the Army of Fear and Book 3 Captain Sun and the Scourge of the Shadow Dragon. These two books focus more on specific themes, where as Rescue Me! is a more overall Worldview tool. The layout is pretty fantastic. Each chapter begins with a couple of pages of comics, then at the end is a page that looks like a comic style newspaper where the take away is. The book begins with, of course, the origin story. It first talks about how every superhero has a story of origin, how they came to be. Then it goes into how Jesus came to be. Rescue Me! is a great way to link things in a way that kids can comprehend it more easily. The second chapter is about Rescue. This one is pretty great because it really showcases Jesus as our hero and savior. It explains it on a level a child can really get, even to the point of explaining a dual identity. The third chapter focuses on the Bad Guy. This was good for us because it's sometimes difficult to explain the concept of sin to a child, especially a child with autism. This chapter does just that. The fourth chapter showcases power. We just talked about this yesterday in church, and this comic is pretty great for explaining the power of God through Jesus, and the power of Prayer. This is probably Mr. B's favorite chapter. Chapter five is one of my favorites. It is about meeting the needs of others, too. It points out that superheroes don't use their power just for neat things, but for NEEDED things. Chapter six has a very important lesson-Secret Identity. This chapter shows how the Jesus taught us to do good things not for show, but just because they needed doing. If we donate to charity, or help others, we are supposed to do so in secret like fashion, not boasting and getting attention for it. The last chapter talks about a team of heroes and equates the Church as God's team. The graphics and artwork are very nice. Of course they are modest and appropriate, and the color is very nice. Captain Sun (AKA Derek Duke,) the superhero in this story, reminds me of a cross between Superman, The Flash, and Vision. He is mainly a vibrant red and golden yellow while the main villian, Black Out, is mostly Purple with a dark hooded cape. It's easy to see the action points, etc, and the overall art work enhances the story. Be sure to check out the Homeschool Review Crew for more great reviews!